At the end of 2017 things couldn’t have been going better for Alessio Stillrich (Fanatic / Duotone) with the then 22-year-old breaking into the world’s top 10 for the first time in his career, however, during his winter training in Cape Town, South Africa 2018, Stillrich suffered a horrific double leg fracture when an aerial at Cape Point went badly wrong. Hi Alessio, how’s it going? It’s going great, I am enjoying being back on the water a lot and to feel like a professional windsurfer again! It’s been just over a year since your major injury… you’ve just been to South Africa - how are you feeling on the water and are you back to 100% now? I am feeling nearly the same as before. The only thing is that I sometimes feel my syndesmosis ligament in the ankle on very flat landings, which is the ligament I also broke last year, but this is getting better and better and will go away soon doctors say! This makes me be a bit insecure sometimes because I never know if the landing is going to hurt or not, but all in all I am feeling good and I would say I am at 90% right now! Are you able to perform all the tricks and jumps you want or are there still some moves to get back in your repertoire? I actually just came out of the water and landed my first goiters! I did not try them until now but they felt great and thank god I did not forget how to do them! So now after doing my first goiters the only move I have not tried until now is the double forward, but apart from that I am doing all the moves I did before. Last year was obviously a big set back for you after finishing 9th overall in 2017- has that made you reevaluate your goals or…? I am really hungry for competition but I have not reevaluated my goals. My goal has always been to improve my overall ranking from the previous year, which I have managed to do until now. So also this year my goal will be to improve upon that 9th place from 2017. I will be quite nervous for sure, especially at the first event, but I hope everything goes well after more than a year without competing and to make a successful comeback! 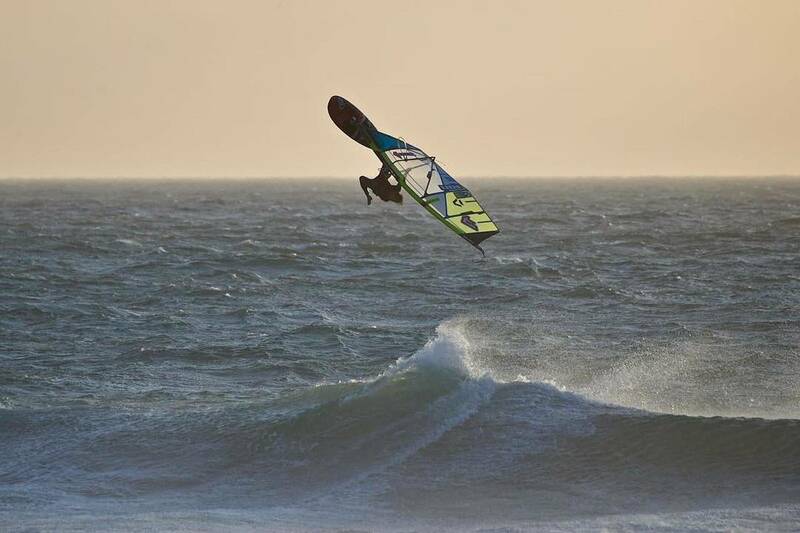 What’s it like to be back on the water after such a long break from windsurfing? It feels amazing! It was a really hard time last year, especially February - June because in this period I could not windsurf at all. In June I slowly started to sail without doing any moves but the big change came just before going to Cape Town as I was able to start jumping. In November I had two screws removed from my knee. They where giving me quite a lot of pain until they were taken out. So after removing them I felt so much better and since then I more or less started to feel the same as before again. I am so thankful that everything turned out well and for being able to sail like before the injury again after one year! How was your trip to South Africa overall? It was great to be back in Cape Town and the place where everything happened. The conditions this year were maybe a bit worse than all the other years I went but still I got to sail a lot. I arrived without having sailed in big waves or strong wind for quite a while and it was a good trip get used to jumping and sailing on a higher level again. Are you back home now? And do you have any more trips planned? Yes I am at home right now, but my next trip will be to Maui for the Fanatic and Duotone photoshoot. I’m looking forward to be back on Maui, especially after not having been there last year! Thanks, Alessio. Great to hear you are almost back to 100%. Enjoy Maui and see you in Gran Canaria for the opening wave event of the year.